Hey there gardener, do I have some gifts for you! The holidays are officially upon us! October is here, the stores are presenting their Christmas lights and mistletoe, and my social media feed is filled with pictures of beautifully grown pumpkin patches. You and I both are wondering what we’re getting you, and you, and you for Christmas this year and wondering how we’re already almost through with 2018. As a “new-serious” gardener of 3 years, I have a few items that I truly love and just couldn’t live without on my homestead. They’re not all items you’d immediately think of, but there’s nothing wrong with that. My Wagon: The Best Gifts for a Gardener! I’ve written about my wagon before in a blog about the best tools for a homesteader. I’m adding it to this list because, after 3 years, it is still in my Top 3 tools that I use almost every single day. It turns out it’s the best gift I’ve ever given myself and I use it more assist my “gardener side” than anything else. Living in Florida, the summers get hot, hot, hot and pushing a wheelbarrow full of dirt eventually gets mighty tiring. That’s where my wagon comes in! Or I’ll lug bags of pine chips or big cubes of straw to mulch with. It’s the best money I think I’ve ever spent. My Camelback: The Next Best Gift for a Gardener! I discovered the beauty of using this as a gardener, and yard in general, this summer and I’d gift it to any outside worker immediately. As stated before, I live in Florida. It’s pretty easy to get overheated or dehydrated! Pull on a camelback, fill it with ice and top it off with water and you have easy access to cold water while sowing your seeds or mowing the garden area. Best quick water fix EVER. Also, you can use a camelback for so many other uses also, such as running or hiking! This comes in as a quick second to the camelback. If I’m doing an evening harvest in the humidity, I fill my stainless steel water bottle up with ice water and carry it on out to the garden. The water stays nice and cold, there’s no condensation to pick up dirt from your hands, and you don’t have to worry about dehydrating. Bonus tip? Fill this bottle up with hot tea or coffee for your morning waters or evening harvests! Pick those thawing carrots with some hot chocolate with the youngins’ and be a star-gardener! I grow fodder for my livestock once our Florida grass starts to die back. I keep my fodder in a shed and I needed a grow light to give it a little extra push. This light has been quite wonderful for my purpose and I’ve even used it for vegetable seedlings! Whether your fellow gardener is sprouting seedlings or fodder, this light is a great gift at a great price. I might be buying a second one in order to expand my fodder operation! A knee pad for kneeling whilst harvesting those delicious vegetables! If you have mulch or pebbles around your gardens, this product is for you! I’m going to be experimenting with sewing some washable, super cute knee pads. These are sold already made at places like Tractor Supply or Amazon. It can be the perfect, cheap “go-to-gift” for your fellow gardener. I’ll admit I don’t have this one yet but it’s on my wishlist! I’d use a knee pad for harvesting usually for I’d love a swivel stool for planting! Sowing seeds can be a very enjoyable, tedious task. It’s something I truly have a love-hate relationship with. I love being connected to the Earth, spending time outside and getting my hands dirty. I really just hate the backaches I’m left with from my low-lying garden beds. I’ll be gifting myself a swivel stool with wheels soon to save my back. I can not wait…maybe I’ll just order it now! I hope these ideas serve you well! 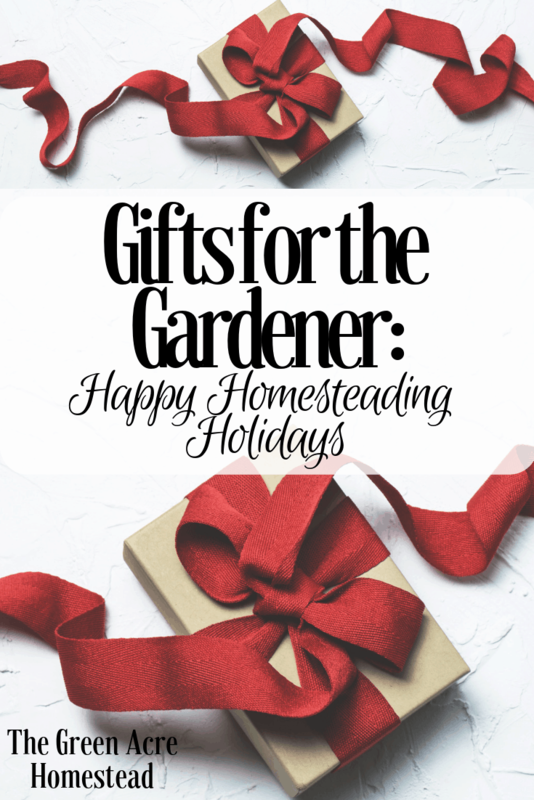 I’d love to hear what you’ve gotten your gardening gals and guys in the past, or what you plan to gift them this year. Drop a line in the comments below and let’s have a chat. Happy Holidays, my friendly folks.